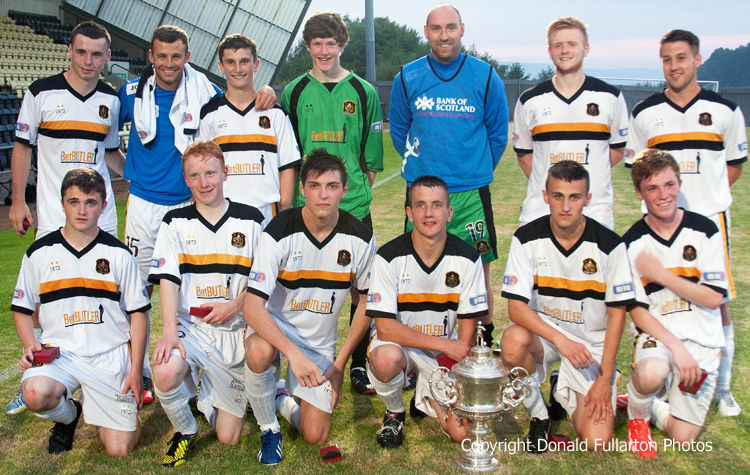 A MOSTLY young Dumbarton team established a 3-0 lead and went on to win the 2012-13 Stirlingshire Cup final at the Bet Butler Stadium on a hot and humid evening. Manager Ian Murray fielded a side with young and Academy players, bolstered by the experience of Bryan Prunty, Garry Fleming, Mark Gilhaney and Scott Smith for this match delayed from last autumn, against a similarly young Falkirk side. The home side took the initiative in the first half and were superior throughout, with goals coming from Gilhaney, youngster Donald McCallum, and Prunty. At half-time Fleming and Prunty were replaced by young players, and the Bairns — sensing that Sons no longer had the same fire power — soon took control, without looking particularly dangerous. However a goal did come when Botti Bia-Bi headed past young keeper Josh Lumsden, and was swiftly followed by a penalty slotted home by Ryan Blair. The visitors tried desperately hard to grab an equaliser which would have meant a penalty decider, but the home defence held out. After the game East Stirling secretary Tadek Kopszywa presented the winners and runners-up medals, and then the historic Stirlingshire Cup to second half skipper Ally McKerracher. The Stirlingshire Cup is one of the oldest competitions in Scottish football, having started in 1883/84.